The move to Gmail has necessitated a change in how email notifications are sent to our members by our Membership Coordinator, Betty Giffin because Gmail limits the number of emails that can be sent out daily. After extensive research, the decision was made to go with a mass emailing service provider called ChimpMail, which will allow us to send out notifications in a timely manner. As a result, please know that when you receive an email with the ChimpMail logo on it, it is from VQC. Over the last couple of months, some of our members and quilt recipients have received emails that appear to be from Victoria’s Quilts Canada. They usually include, in the message content, a link that ends in .php. These messages are not coming from VQC. We checked with our IT specialist and what has happened is that hackers have gotten into Yahoo’s password database. This allows them to access the contact lists of subscribers to this service provider and then send out malicious email to these contacts. This is also the case with service providers that use Yahoo (such as Rogers), as well as Hotmail and service providers that use Hotmail (such as Sympatico). If you have an email address with any of these service providers, you are vulnerable to being used as a conduit for such spam. Although we cannot stop spammers who already have our contact lists, we are taking steps to mitigate the problem. We have replaced the old Yahoo email addresses used by our National Office (general enquiries, requesting a quilt, membership coordinator) with Gmail ones (which are still secure) and are moving our contacts lists from Yahoo to Gmail. We have also created email aliases ending in @victoriasquiltscanada.com, which is our domain name and easily recognizable, that will redirect messages to the new Gmail addresses and will appear in messages we send out. We now need your help. When you receive a message that seems to come from Victoria’s Quilts Canada, check the address in the 'From' field. The important part of the address is after the @ symbol. If it looks unfamiliar or strange (e.g. @pre-air.com, @venosites.be, @nulldevice.net), it’s not from VQC. The other giveaway is that the message asks you to click on a link that often ends with .php. Please do NOT click on any such links, as they are executable files and will compromise your computer. You should mark such messages as spam/junk mail to help your email system filter out similar messages in the future. If you have a Yahoo/Rogers/Hotmail/Sympatico email address, change your password immediately, and repeat frequently. We also strongly recommend that you replace such email addresses with Gmail ones, then move your contacts to the Gmail address and get rid of the old email address. If you want to keep your old email address for personal use, you should still create a Gmail address for VQC matters and move your VQC addresses to Gmail. That way, they won’t be available to future hackers. Once you have set up a Gmail address, please make sure to let Betty Giffin, our VQC Membership Coordinator, know so that she can update her email database. If you are a Branch Coordinator, please also let Michelle Gagnon (VQC Communications) know so that she can update the email contacts on the Branch pages. Our annual fashion show once again took place with a full house, and great fun was had by all who attended. 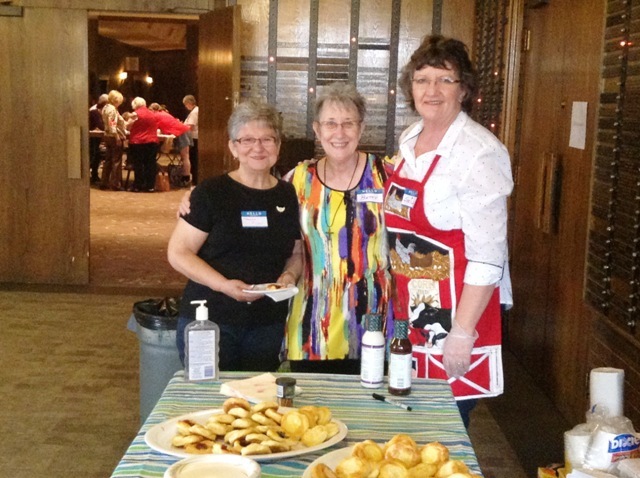 This year, we changed the timing and held it in the fall on Saturday, October 17 at City View United Church. Wonderful desserts were served along with coffee and tea before the show began. During this time, participants had an opportunity to bid on some marvelous gifts available in our silent auction as well as purchase other items for Christmas at our sales table. The fashion show followed, with the keynote color this year being electric blue. All of the models were members of Victoria’s Quilts Canada. We would like to extend our sincere thanks to Michelle Gilchrist, Manager of Nygard in Barrhaven, who pulled the fashions together, and Debbie Kilpatrick, the Regional Manager, who did a running commentary on the outfits. Thank you also to our models, who strutted their stuff with great courage, and to those who brought the many wonderful desserts. But the greatest thanks go to the many people who attended. You helped us raise just over $2,300, all of which will help us to continue making quilts. Another fashion show is planned for 2016. We look forward to seeing you there! Victoria’s Quilts Canada would like to extend a very warm welcome to our two newest Branches: Woodstock/Oxford in Ontario and Tignish in Prince Edward Island. The Woodstock/Oxford Branch started as a Friends Group attached to the Waterloo/Wellington Branch in March 2015. The group quickly grew and, in mid-August of this year, Led by Mary Moore, it currently has 20 volunteers plus numerous other individuals living in surrounding communities such as Tillsonburg. The Branch meets twice a month and delivers quilts mainly to Oxford County and London, Ontario. Since forming the Friends Group in March, it has completed 50 quilts and an additional 60 are still in progress. The Branch can be reached at oxford@victoriasquiltscanada.com. Tignish became a Branch in June 2014 and was off to a running start. As of September 20, 2015, it has delivered 92 quilts across Prince County. It also held a fundraising bingo, as well as a raffle, and was written up twice in P.E.I.’s Journal Pioneer. The Branch started with five founding members and now has 15 volunteers who meet on a weekly basis. It is led by Anne Marie McInnis and can be reached at tignish@victoriasquiltscanada.com. With more Branches being opened in communities across Canada, the number of quilts made and distributed within that community will also increase. And the funds that would have been spent on mailing quilts from the National Office or another Branch can be redirected into producing more quilts. Congratulations, and welcome, to Woodstock/Oxford and Tignish. Keep up the good work! Mark it on your calendar! Saturday, October 17, 2015. And join us for our annual Fashion Show at City View United Church, 6 Epworth Avenue in Nepean. We are thrilled once again to have Nygard providing their beautiful clothing for the show. As before, our very professional VQC models will be wearing all these beautiful fashions for your enjoyment. Nygard will also have a large stock of clothing onsite, allowing everyone to try on and purchase their favourite items right on the spot. To reserve your ticket ahead of time, call or e-mail Kathy Yach at 613-224-6835 or cityviewky@rogers.com. The event will begin at 1:00 p.m., when home-made desserts are served, followed by the Fashion Show at 2:00 pm. Tickets cost $15 and often sell out quickly. Once again, we will have items for sale as well as our popular silent auction. It’s a fun place to pick up some of those early Christmas presents. Proceeds from the sale of tickets and the silent auction will enable Victoria's Quilts Canada to purchase the supplies necessary to continue making quilts. The afternoon promises to be lots of fun, and we get a taste of Nygard’s fantastic fall and winter fashions. We hope to see you there. We are thrilled to announce that $14,747.31 was raised during this year’s annual Radio-thon, held on June 21, 2015. This will allow Victoria’s Quilts Canada to make and deliver 350 quilts to people living with cancer in communities across Canada. Thank you to all our wonderful supporters, who so generously donated not only this year, but in past years as well. Victoria’s Quilts Canada (VQC) greatly appreciates Rabbi Bulka’s support in dedicating his radio program, Sunday Night with Rabbi Bulka, to raising these funds for VQC (airs weekly from 10:00 to 11:00 p.m. on 580 CFRA). Thanks also to Steve Madely, host of CFRA's Madely in the Morning program, for co-chairing the program with Rabbi Bulka, and a big thank you to our wonderful volunteers who worked to organize this event. Join us for the 6th Annual Rabbi Bulka Radio-thon! Mark Sunday, June 21st , 2015 on your calendars and tune in to Rabbi Reuven Bulka's radio program on 580 CFRA from 10:00 p.m. to 11:00 p.m. 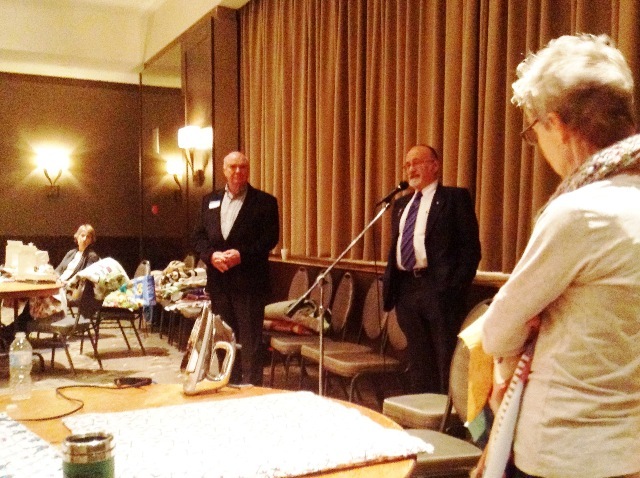 Rabbi Bulka has once again generously dedicated his program as a fundraiser for Victoria's Quilts Canada (VQC). Joining Rabbi Bulka as co-host will be Steve Madely, host of CFRA's Madely in the Morning. Victoria’s Quilts Canada is a registered, non-profit, charitable organization committed to providing quilts to anyone in Canada diagnosed with cancer. These quilts are a gift, and no cost is ever passed on to the quilt recipient or to the person requesting it. The cost to make and deliver these quilts are significant, and we rely solely on the generosity of our donors and our volunteers to carry out our mission. Your donation during the Radio-thon is therefore very important. It will enable us to continue purchasing supplies, such as cotton, flannelette and batting to make quilts, and to pay for their distribution across Canada. We do not have any paid staff. Our goal this year is $20,000. We hope you will be able to make this goal a reality. How to donate: Donate online now via CanadaHelps, or call (613) 521-9700 during the Radio-thon. 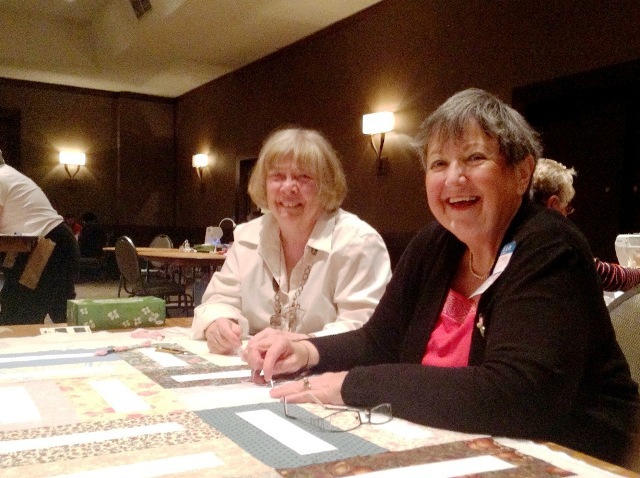 Congratulations to everyone who participated in Victoria's Quilts Canada's second annual Gayle Madely Memorial Quilt-a-thon on Sunday, April 26, 2015, at the Congregation Machzikei Hadas in Ottawa. 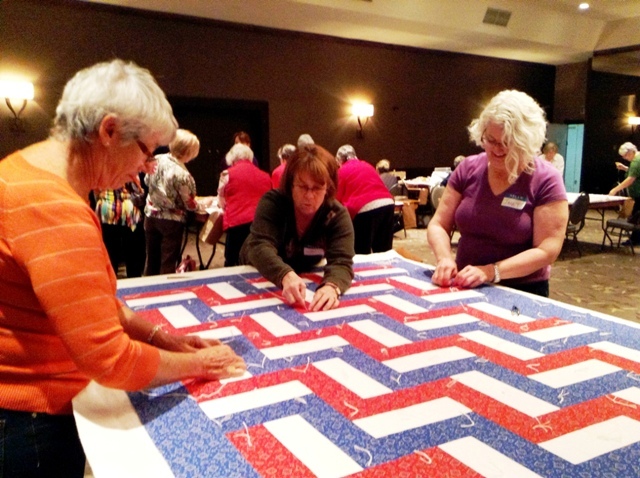 About 65 people joined forces for a day of fun, companionship and hard work to make about 120 quilts. These quilts will be distributed, at no charge, to individuals living with cancer across Canada. The quilts bring with them a sense of peace, comfort, warmth, and a feeling that people care. These feelings are very important to someone struggling with the fear and pain of cancer. Our sincere thanks to our dedicated volunteers, who worked their way through cutting, ironing, pinning, tying, sewing and quilting to make these beautiful quilts. Some participants travelled a distance to join us, and we appreciated their presence. Others, new to VQC, heard about the Quilt-a-thon and decided to join in to find out more about us and possibly become a member. We are always on the lookout for new, enthusiastic volunteers to help us make our quilts. Thank you to all the people who helped organize Sunday's event. A special thank you to Rabbi Bulka for providing the Synagogue and to CFRA's Steve Madely for his continued support and his presence at this year's event. Finally, thank you to our wonderful volunteers who continue to support our work across the country year after year. Please let us know no later than April 11, 2015 if you plan to attend by calling (613) 843-9212 or sending us an e-mail. Mark your calendars! The Annual General Meeting for Victoria's Quilts Canada will take place on Saturday, May 2, 2015 from 1:00 pm to 4:00 pm. It will be held at City View United Church at 6 Epworth Avenue in Nepean, which is the church just around the corner from St. Richard's. The meeting provides an opportunity for members to find out what VQC is doing and how it is continuing to grow. VQC members can also help the Board make decisions about our future by voting on the business conducted at this meeting and on nominations for new Board members. As those who have attended in the past will attest, however, the meeting will not be all serious business. It's an opportunity to thank our volunteers for all their hard work and dedication in a social atmosphere where members can interact. Refreshments will be provided and a variety of items will be on sale including quilting books, tools, funky fabrics and other surprises. A proposed agenda and draft 2014 Annual General Meeting Minutes will be sent out shortly to VQC members, followed by distribution of the 2014 Annual Report (PDF format) later in April. Proxy forms will also be sent out for those unable to attend who would like someone else to vote on their behalf. For those who cannot be reached by electronic means, please contact your Branch or Friends Group Coordinator for this information. For those traveling from out-of-town, please note that VQC funds cannot be used to reimburse travel and living expenses. If you can join us on May 2nd, however, we would be very glad to see you. If you are unable to attend, please accept our heartfelt thanks and a thank you from all of those whose lives you have touched. Good news! The Gayle Madely Memorial Quilt-a-thon, whose inauguration in 2014 was such a huge success, is coming back again for a second time. This year, the date is Sunday, April 26, 2015 and the hours are 8:30 am to 4:00 pm. It will be held, once again, at the Congregation Machzikei Hadas, which is located at 2310 Virginia Drive. 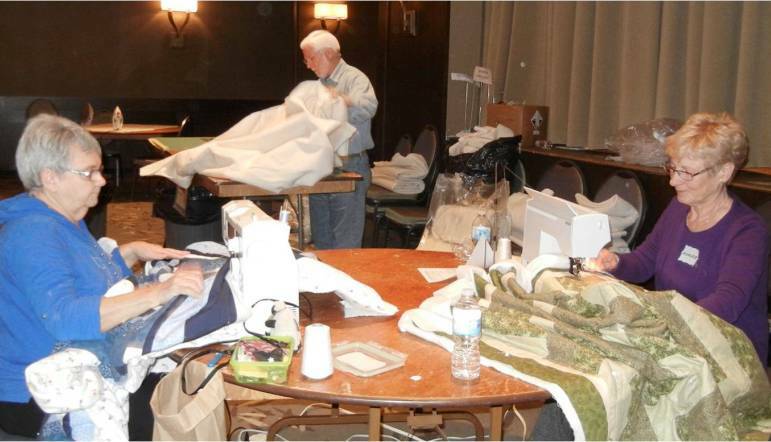 The Quilt-a-thon was established to honour Gayle Madely, wife of CFRA radio's Steve Madely. Gayle passed away two years ago from cancer. During her illness, the quilt she received from us brought her great comfort both physically and spiritually. Steve is a staunch supporter of Victoria's Quilts Canada and has participated in our annual Radio-thon for several years, along with Rabbi Bulka, its host. To thank Steve in a meaningful way for this support, we held a Quilt-a-thon in Gayle's memory in 2014. Rabbi Bulka was instrumental in making it happen by offering us space in his shul. Since the shul is a kosher environment, we ask that you bring no food with you to this event. We will provide snacks and lunch. Should you have any dietary restrictions, please let us know and we will insure that your needs are met. Be sure to reserve the date. Registration is limited and therefore required. The cost is $15.00 per person, payable at the door. You don't need to be a member of VQC to participate. To sign up, please fill in and submit the online registration form. The deadline for registering is April 19, 2015. If you are unable to register online, you can obtain a paper version of the form from your Friends Group Coordinator.